For related races, see 1832 United States elections. Presidential election results map. 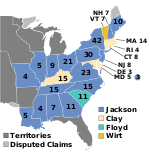 Blue denotes states won by Jackson and Van Buren or Wilkins, light yellow denotes those won by Clay/Sergeant, teal denotes those won by Floyd/Lee, and orange denotes those won by Wirt/Ellmaker. Numbers indicate the number of electoral votes allotted to each state. Two votes were not given in Maryland. The 1832 United States presidential election was the 12th quadrennial presidential election, held from Friday, November 2, to Wednesday, December 5, 1832. It saw incumbent President Andrew Jackson, candidate of the Democratic Party, defeat Henry Clay, candidate of the National Republican Party. The election saw the first use of the presidential nominating conventions, and the Democrats, National Republicans, and the Anti-Masonic Party all used national conventions to select their respective presidential candidates. Jackson won re-nomination with no opposition, and the 1832 Democratic National Convention replaced Vice President John C. Calhoun with Martin Van Buren. The National Republican Convention nominated a ticket led by Clay, a Kentuckian who had served as the Secretary of State under President John Quincy Adams. The Anti-Masonic Party, one of the first major third parties in U.S. history, nominated former Attorney General William Wirt. Jackson faced heavy criticism for his actions in the Bank War, but he remained popular among the general public. 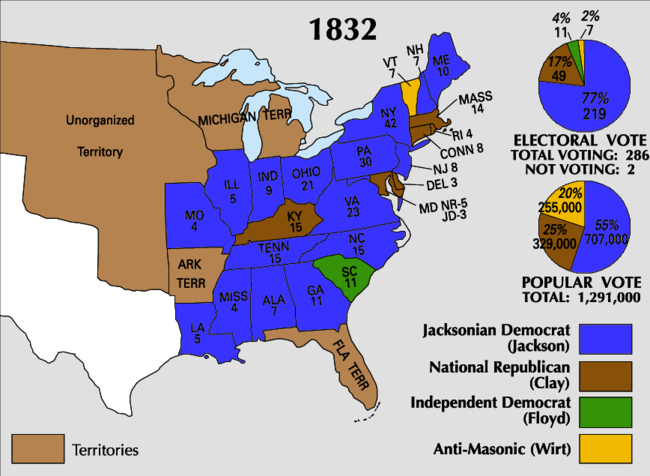 Jackson won a majority of the popular vote and 219 of the 286 electoral votes cast, carrying most states outside of New England. Clay won 37.4% of the popular vote and 49 electoral votes, while Wirt won 7.8% of the popular vote and carried the state of Vermont. Virginia Governor John Floyd, who had not actively campaigned, received the electoral votes of South Carolina. After the election, members of the National Republican Party and the Anti-Masonic Party formed the Whig Party, which became the primary opponent to the Democrats over the next two decades. Henry Clay won the popular vote in Maryland by just four votes- the smallest vote margin in any state ever. George W. Bush would win Florida by a smaller percentage in 2000, but the actual number of votes was larger. With the demise of the Congressional nominating caucus in the election of 1824, the political system was left without an institutional method on the national level for determining presidential nominations. For this reason, the candidates of 1832 were chosen by national conventions. The first national convention was held by the Anti-Masonic Party in Baltimore, Maryland, in September 1831. The National Republican Party and the Democratic Party soon imitated them, also holding conventions in Baltimore, which would remain a favored venue for national political conventions for decades. President Jackson and Vice-President John C. Calhoun had a strained relationship for a number of reasons, most notably a difference in opinions regarding the Nullification Crisis and the involvement of Calhoun's wife Floride in the Eaton affair. As a result of this, Secretary of State Martin Van Buren and Secretary of War John H. Eaton resigned from office in April 1831, and Jackson requested the resignation of all other cabinet offices as well except one. 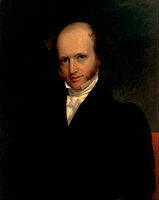 Van Buren instigated the procedure as a means of removing Calhoun supporters from the Cabinet. 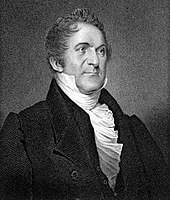 Calhoun further aggravated the president in the summer of 1831 when he issued his "Fort Hill Letter," in which he outlined the constitutional basis for a state's ability to nullify an act of Congress. The final blow to the Jackson-Calhoun relationship came when the president nominated Van Buren to serve as Minister to the United Kingdom and the vote in the Senate ended in a tie, which Calhoun broke by voting against confirmation on January 25, 1832. At the time of Calhoun's vote to end Van Buren's political career, it was not clear who the candidates of the Democrats would be in the election later that year. Jackson had already been nominated by several state legislatures, following the pattern of 1824 and 1828, but his worry was that the various state parties would not unite on a vice-presidential nominee. As a result, the Democratic Party followed the pattern of the opposition and called a national convention. The 1832 Democratic National Convention, the first of the Democratic Party, was held in the Athenaeum in Baltimore (the same venue as the two opposition parties) from May 21, 1832, to May 23, 1832. Several decisions were made at this initial convention of the party. On the first day, a committee was appointed to provide a list of delegates from each state. This committee, which later came to be called the Credentials Committee, reported that all states were represented. Delegates were present from the District of Columbia, and on the first contested roll call vote in convention history, the convention voted 126-153 to deprive the District of Columbia of its voting rights in the convention. The Rules Committee gave a brief report that established several other customs. Each state was allotted as many votes as it had presidential electors; several states were over-represented, and many were under-represented. Secondly, balloting was taken by states and not by individual delegates. Thirdly, two-thirds of the delegates would have to support a candidate for nomination, a measure intended to reduce sectional strife. The fourth rule, which banned nomination speeches, was the only one the party quickly abandoned. No roll call vote was taken to nominate Jackson for a second term. Instead, the convention passed a resolution stating that "we most cordially concur in the repeated nominations which he has received in various parts of the union." Martin Van Buren was nominated for vice-president on the first ballot, receiving 208 votes to 49 for Philip Pendleton Barbour and 26 for Richard Mentor Johnson. Afterwards, the convention approved an address to the nation and adjourned. The Barbour Democratic National Convention was held in June 1832 in Staunton, Virginia. Jackson was nominated for president and Philip P. Barbour was nominated for vice-president. Although Barbour withdrew, the ticket appeared on the ballot in five states: Alabama, Georgia, Mississippi, North Carolina, and Virginia. Soon after the Anti-Masonic Party held its national convention, supporters of Henry Clay called a national convention of the National Republican Party. 18 of the 24 states sent delegations to the convention, which convened on December 12, 1831. Four of the six states that did not send delegations were states of the Deep South. On the fourth day of the convention, the roll call ballot for president took place. The chairman of the convention called the name of each delegate, who gave his vote orally. Clay received 155 votes, with delegate Frederick H. Shuman of North Carolina abstaining because he believed that Clay could not win and should wait until 1836. As additional delegates arrived, they were allowed to cast their votes for Clay, and by the end of the convention he had 167 votes to one abstention. A similar procedure was used for the vice-presidential ballot. Former Congressman John Sergeant of Pennsylvania was nominated with 64 votes to six abstentions. Sergeant, a prominent Philadelphia attorney with connections to the Second Bank of the United States and a reputation as an opponent of slavery, provided the ticket with geographical balance. After the nominations, the convention appointed a committee to visit Charles Carroll of Carrolton, the last surviving signer of the Declaration of Independence, then adopted an address to the citizens of the nation. The Anti-Masonic Party held the first national nominating convention in American history. 111 delegates from 13 states (all from free states, except for Maryland and Delaware) assembled in the Athenaeum in Baltimore from September 26, 1831, to September 28, 1831. Several prominent politicians were considered for the presidential nomination. Richard Rush would have been the nominee, but he pointedly refused. As a result of this action, along with his softness towards Andrew Jackson, former President John Quincy Adams never forgave him. Adams was willing to run as the Anti-Masonic candidate, but the party leaders did not want to risk running someone so unpopular. The delegates met behind closed doors for several days before the convention officially opened, in which the convention made some initial decisions. Several unofficial presidential ballots and one official ballot were taken, in which William Wirt defeated Rush and John McLean for the nomination. Ironically, Wirt was a Mason and even defended the Order in a speech before the convention that nominated him. Wirt hoped for an endorsement from the National Republicans. When the National Republican Party nominated Henry Clay, Wirt's position after their convention became an awkward one. He did not withdraw, even though he had no chance of being elected. The convention was organized on September 26 and heard reports of its committees on the 27th. The 28th was spent on the official roll call for president and vice-president. During the balloting, the name of each delegate was called, after which that delegate placed a written ballot in a special box. Wirt was nominated for president with 108 votes to one for Richard Rush and two abstentions. Amos Ellmaker was nominated for vice-president with 108 votes to one for John C. Spencer (chairman of the convention) and two abstentions. 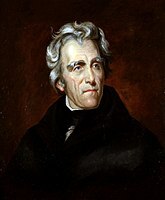 While the South Carolina state legislature remained nominally under Democratic control, it refused to support Jackson's re-election due to the then-ongoing Nullification Crisis, and instead opted to back a ticket proposed by the Nullifier Party led by John C. Calhoun. The Nullifiers were made up of former members of the Democratic-Republican Party who had largely supported Jackson at the previous election, but were much stauncher proponents of states' rights, something which ultimately caused them to repudiate Jackson during his first term. Calhoun himself declined to head the ticket, however, and instead nominated Governor of Virginia John Floyd, who had also become opposed to Jackson's stances on the issue of states' rights. Merchant and economist Henry Lee was nominated as Floyd's running-mate. Ultimately, Floyd's candidacy amounted to little more than a protest against Jackson, as his ticket did not run in any state outside of South Carolina. He nonetheless received all of the state's electoral votes. Results by county explicitly indicating the percentage of the winning candidate in each county. Shades of blue are for Jackson/Van Buren (Democratic), shades of orange are for Clay (National Republican), shades of red are for Wirt (Anti-Masonic), and shades of green are for Jackson/Barbour (Democratic). The election campaign revolved around the Second Bank of the United States. Jackson, who disliked banks and paper money in general, vetoed the renewal of the Bank's charter and withdrew federal deposits from the bank. Clay hoped to divide Jackson's supporters and curry favor in Pennsylvania, the bank's headquarters, by attacking Jackson. His supporters criticized Jackson's use of presidential veto power, portraying him as "King Andrew." However, the attacks on Jackson generally failed, in spite of heavy funding by the bank, as Jackson convinced the ordinary population that he was defending them against a privileged elite. Jackson campaign events were marked by enormous turnout, and he swept Pennsylvania and the vast majority of the country. Jackson's popularity with the American public and the vitality of the political movement with which he was associated is confirmed by the fact that no president was again able to secure a majority of the popular vote in two consecutive elections until Ulysses S. Grant in 1872. To date, only two other presidents from the Democratic party were ever able to replicate this feat: Franklin D. Roosevelt (for the first time in 1936) and Barack Obama (in 2012). Furthermore, no president succeeded in securing re-election again until Abraham Lincoln in 1864. In spite of his achievement, Jackson was the second of only five presidents to win re-election with a smaller percentage of the popular vote than in the prior election. The other four are James Madison in 1812, Grover Cleveland in 1892, Franklin D. Roosevelt in 1940 and 1944, and Barack Obama in 2012. Following the election and Clay's defeat, an Anti-Jackson coalition would be formed out of National Republicans, Anti-Masons, disaffected Jacksonians, and small remnants of the Federalist Party whose people whose last political activity was with them a decade before. In the short term, it formed the Whig Party in a coalition against President Jackson and his reforms. This was the last election in which the Democrats won Tennessee until 1856, the last in which the Democrats won New Jersey until 1852, the last in which the Democrats won Ohio until 1848, and the last in which the Democrats won Indiana and Georgia until 1844. This was also the only election in which Kentucky voted for the National Republicans. Source (Popular Vote): Leip, David. "1832 Presidential Election Results". Dave Leip's Atlas of U.S. Presidential Elections. Retrieved July 27, 2005. Source (Electoral Vote): "Electoral College Box Scores 1789–1996". National Archives and Records Administration. Retrieved July 31, 2005. (a) The popular vote figures exclude South Carolina where the Electors were chosen by the state legislature rather than by popular vote. (b) 66,706 Pennsylvanians voted for the Union slate, which represented both Clay and Wirt. These voters have been assigned to Wirt and not Clay. (c) All of John Floyd's electoral votes came from South Carolina where the Electors were chosen by the state legislatures rather than by popular vote. (d) Two electors from Maryland failed to cast votes. ^ Chase, James S. Emergence of the Presidential Nominating Convention, 1789-1832 (1973). ^ Deskins, Donald Richard; Walton, Hanes; Puckett, Sherman (2010). 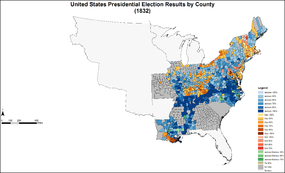 Presidential Elections, 1789-2008: County, State, and National Mapping of Election Data. University of Michigan Press. pp. 97–98. ^ Haynes, Stan M. (2012). The First American Political Conventions: Transforming Presidential Nominations, 1832–1872. McFarland. pp. 30–31. ^ a b James Schouler (1889). History of the United States of America Under the Constitution: 1831-1847. 1889. W.H. & O.H. Morrison. Retrieved December 24, 2010. ^ Hugh Chisholm (1910). Encyclopædia Britannica: A Dictionary of Arts, Sciences, Literature and General Information. Encyclopædia Britannica Company. Retrieved December 24, 2010. ^ "Niles' Weekly Register". Baltimore: Franklin Press. n.d.
^ "FLOYD, John". Biographical Directory of the United States Congress. Retrieved January 12, 2019. Cole, Donald B. "The Presidential Election of 1832 in New Hampshire." Historical New Hampshire 21#1 (1966) pp: 32-50. Folsom, Burton W. "Party Formation and Development in Jacksonian America: The Old South." Journal of American Studies 7#3 (1973): 217-229. Gammon, Samuel Rhea (1922). The Presidential Campaign of 1832 (PDF). Johns Hopkins Press. National Republican Party (U.S.). Massachusetts (1831). Journal Of The National Republican Convention, Which Assembled In The City Of Baltimore, Dec. 12, 1831, For The Nominations Of Candidates To Fill The Offices Of President And Vice President. Washington: National Journal. Democratic National Convention (1832). Summary Of The Proceedings Of A Convention Of Republican Delegates, From The Several States In The Union, For The Purpose of Nominating A Candidate For The Office Of Vice-President Of The United States; Held At Baltimore, In The State Of Maryland, May, 1832. Albany: Packard and Van Benthuysen. Note: the account of the convention in Niles' Weekly Register has more information than the printed proceedings. The proceedings of the United States Anti-Masonic Convention: held at Philadelphia, September 11, 1830. "Elections". answers.com. Retrieved March 19, 2005.
source for "Electoral college selection"
"Pennsylvania Presidential Election Returns 1832". The Wilkes University Election Statistics Project: Pennsylvania Election Statistics: 1682–2006. Archived from the original on May 15, 2005. Retrieved March 19, 2005. 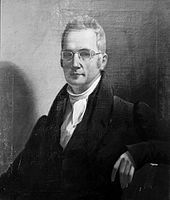 Wikimedia Commons has media related to 1832 United States presidential election. This page was last edited on 4 April 2019, at 01:48 (UTC).